In the search for the world’s best breakfasts, the Mac Attack at The Macintosh in Charleston is a winner. This isn’t a dish you’re likely to make at home or one you would want to eat very often. But everyone should experience the wonderful flavors and textures of the totally unique “Mac Attack” at least once—even if it sounds like (and probably is) something that’s far less healthy than an egg white omelet. The Mac Attack is Executive Chef Jeremiah Bacon’s creative Lowcountry take on classic Eggs Benedict that’s served at The Macintosh on King Street in Charleston, South Carolina. He’s created a totally delicious and unique breakfast entree. Instead of sitting on the traditional English muffin, a poached egg is placed atop bone marrow bread pudding. To make the pudding, the chef soaks a piece of brioche in rendered veal marrow, cream, and egg yolks, and sears it on both sides (so it looks much like French toast). The chef also substitutes steamed kale for spinach. 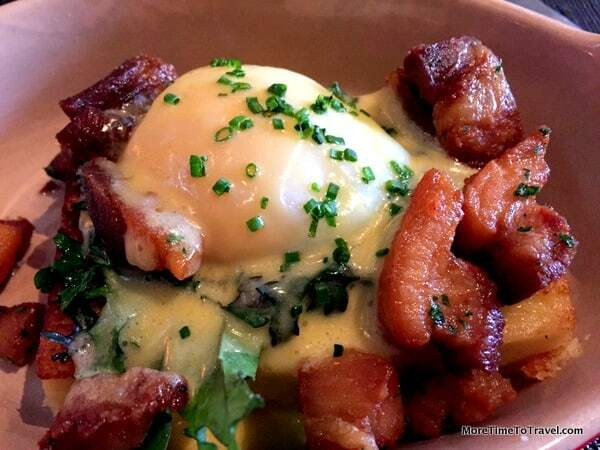 Like the classic, the egg is topped with Hollandaise Sauce but instead of using bacon or ham, the Chef garnishes the dish with generous pieces of pork belly, and plates it in a piece of oval-shaped Le Creuset stoneware. Our waitress, Meghan, told us that the pork is brined, cured, and deep-fried, a worth-waiting-for process that takes two days. Chef Bacon (yes, that’s really his surname) is a Charleston native and graduate of the Culinary Institute of America. A three-time James Beard semifinalist, he emphasizes locally sourced items on a menu that changes daily. I clearly need to have breakfast at The Macintosh next time I’m in Charleston. That might be the most tempting breakfast pic I’ve ever seen. Chef Bacon was obviously destined to be a chef — wonderful name! Chef Bacon! What a perfect name for this breakfast chef! Though with his credentials, it sounds like he can whip up a lot more than breakfast :-). This take on Eggs Benny looks scrumptious – though you’d probably have to eat rabbit food for the next few days to counteract all the delicious fat calories :-).